DUMBARTON were unlucky not to beat Greenock Morton at Cappielow, with 'Ton manager Jim Duffy admitting Sons were the better side. DUMBARTON were unlucky not to beat Greenock Morton in front of a 1,586 crowd at Cappielow, with 'Ton manager Jim Duffy admitting Sons were the better side. Instead former Morton player Stevie Aitken's Sons side had to settle for a 1-1 draw in a match in which they were given no favours by ref Mat Northcroft, the last of which was to chalk off a late Joe Thomson shot from distance because of a foul on keeper Derek Gaston. "I saw no foul on the keeper," Jim Duffy said afterwards. Sons started brightly, winning three corners within the first ten minutes and putting 'Ton under some pressure. The Greenock side looked dangerous when they broke, but it was Sons who went in front from a goalmouth scramble on 26 minutes. Keeper Gaston flapped at the ball, and Robert Thomson tapped it into the net (pictured). 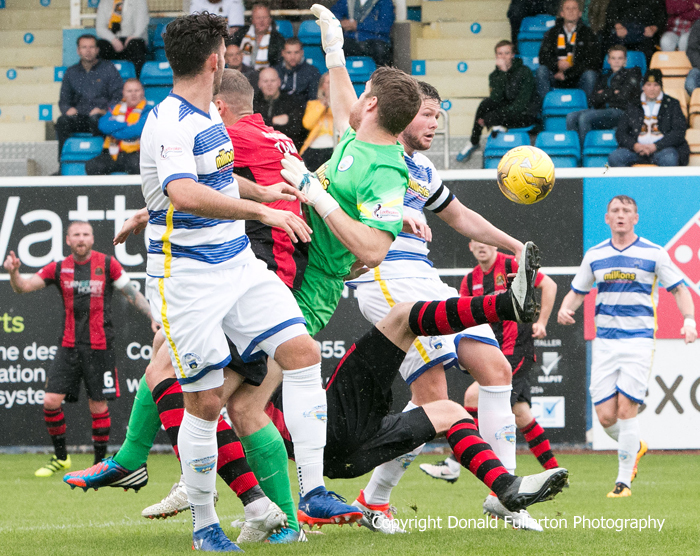 What was becoming a muscular contest continued after the break with Morton pressing early and Dumbarton hitting back hard. On 59 minutes Sons had a good penalty appeal turned down, when Robert Thomson appeared to have his legs taken from behind him on the edge of the box. But it was Morton who struck next. Kudus Oyunega equalised from close range on 62 minutes, after the visitors failed to clear from a rather dubious corner. Sons were on the back foot now, and Grant Gallagher was a whisker away from heading into his own net as the ball cannoned off the bar and upright on 78 minutes. It looked as if Dumbarton had won the game on 86 minutes, as Joe Thomson smacked the ball home through a packed penalty area. But the strike was disallowed for an infringement on the keeper. Right at the end Oyunega missed a diving header from point blank range, meaning that the game ended as a hard fought draw.